Repair welding in the mountains, installations in the countryside or welding operations at exposed locations: until recently, this type of work involved costly and time-consuming preparations. 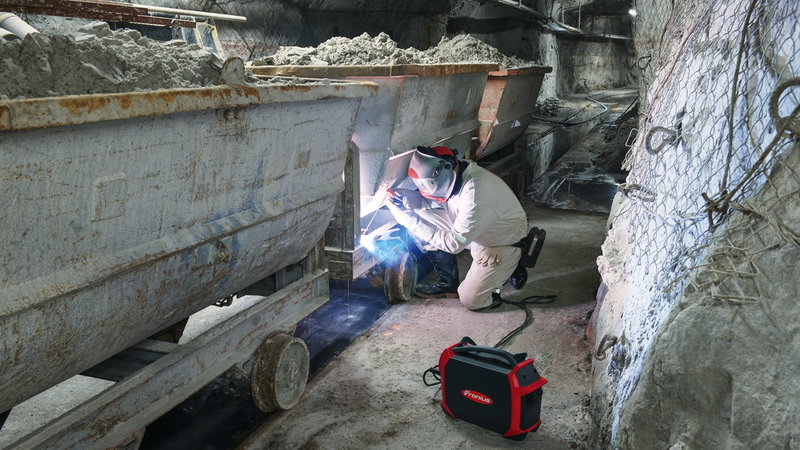 Long mains leads or big heavy generators are now no longer necessary, because the Fronius AccuPocket 150/400 ushers in a new and unprecedented era of mobile welding. It is the world's first-ever MMA welding system with a high-performing lithium-ion rechargeable battery and a low overall weight of only 11 kg / 31 lbs, giving users unprecedented freedom of movement in MMA and TIG welding. The ActiveCharger battery charging system supplied with the AccuPocket is specially tailored to the requirements of the welding system, and is based on Fronius' proven Active Inverter Technology. An intelligent control system using AccuBoost Technology ensures that the battery and the welding electronics work together in perfect harmony. In practice, this means better welding results than could be obtained with a comparable mains-only MMA welding system are regularly achieved. Battery mode is specially designed for repair welding on inaccessible sites without direct access to mains electricity, as well as being highly suitable for welding in electrically hazardous environments. In battery mode, the welding energy is drawn solely from the battery. A fully charged battery delivers sufficient power to weld up to eight 3.25 mm diameter electrodes or eighteen 2.5 mm diameter electrodes. Due to the low current consumption, a much smaller generator (2 kVA) can be used than for mains-connected appliances – with AccuPocket, having to use big, heavy 8 kVA generators is definitely a thing of the past. This makes mobile applications much easier and saves on investment outlays. In Hybrid mode, the unit can be used for welding at the same time as being charged. The integrated power reserve of the battery guarantees a constant arc – even in the event of mains voltage fluctuations – and prevents the mains fuse tripping if overvoltages occur. Even on a 120 V grid, the full output power of 150 A is possible. AccuBoost brings tangible improvements to ignition properties, arc stability and arc dynamics. The integrated high-performance battery can provide very high short-circuit currents for brief periods during welding and reliably minimises electrode sticking. This perfect interplay between the battery and the welding electronics also makes it possible to have a high welding voltage at maximum power, which prevents annoying arc breaks. The AccuPocket's battery is a high-performance iron-phosphate-based lithium-ion (LiFePO4) battery with a capacity of approx. 400 Wh. This corresponds to 160 cm of a TIG weld seam produced in 17 minutes' welding time (130 A, a-dimension 2 mm), or eighteen 2.5 mm electrodes. Complying with stringent safety standards, these battery cells put in a particularly convincing performance in high-power applications and stand out for the following attributes: high intrinsic reliability, no memory effect, long service life and low self discharge.